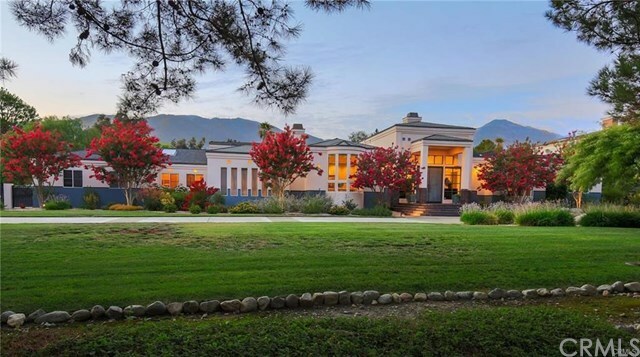 This contemporary gated resort-like estate, constructed in 1992, is nestled in the foothills below Mt. Baldy and sits on a 56,038 square feet south-facing lot in prestigious neighborhood of Claremont. This custom home built by architect Peter Volbeda, AIA, o?ers 6,007 square feet of living area including 5 bedroom suites plus powder room, expansive entry foyer, formal library, living room, family room, gourmet kitchen with butler pantry, breakfast area, sunroom, wet bar, fitness room, office/reading room, laundry room with sewing center as well as gallery halls. The acreage is fully landscaped with mature specimen trees, drought tolerant plantings, decorative hardscape, and lighting, putting green and sports court and private patios with fountains. The lush surroundings complement the three structures positioned for privacy and visual integrity. The back house is found at the end of the long driveway by the pool. Built in 2003, the 1,933 square feet of living space of a contemporary design provides a private guest quarter with full kitchen, and a large entertainment center, inclusive of a wine room. Private patios overlooking the pool and a pond add to the serenity and seclusion. By the pool, a third 400 square foot building features a full patio bath and a built-in barbecue kitchen and 2 spacious storage rooms. in 2017 owner upgraded luxury white oak wood flooring.